Have You Ever Dreamt Of Flawless Skin Without Surgery? Let our Aesthetician Kelly customize a facial specific to your skincare needs. All of her facials begin with a consultation so your concerns, questions and desired results are met. She will choose exactly the right products to be used during your facial and lastly, she will prescribe a home care regime to go beyond the results you see in the treatment room. With 11 years experience, she is sure to educate you in her craft. The HydraFacial is the Cadillac of all facial treatments, providing INSTANT RESULTS and completely non-invasive. It’s one of a kind vortex fusion cleanses, exfoliates, extracts and infuses hydrating serums containing honey, hyaluranic acid, vitamins E and A, white tea extract and horse chestnut seed extract and glycolic acid. Research has shown that the HydraFacial beats IPL Laser and Microdermabrasion as far as better results and rejuvenation. Afraid of needles? Try one of the HydraFacials many add on treatments, DermaBuilder or “Baby BOTOX”, it enhances the skins elasticity, smoothes the skins texture and increases firmness. 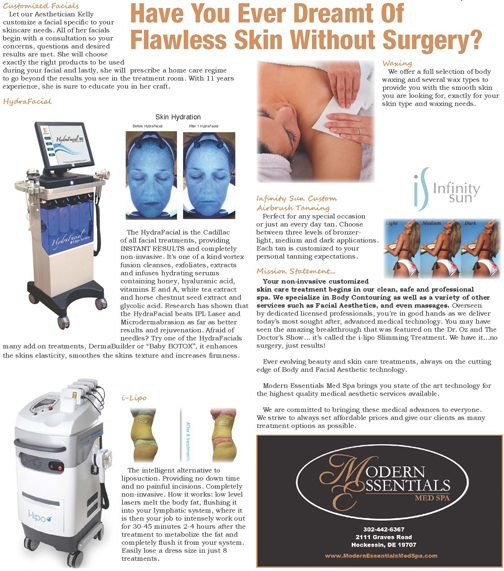 The intelligent alternative to liposuction. Providing no down time and no painful incisions. Completely non-invasive. How it works: low level lasers melt the body fat, flushing it into your lymphatic system, where it is then your job to intensely work out for 30-45 minutes 2-4 hours after the treatment to metabolize the fat and completely flush it from your system. Easily lose a dress size in just 8 treatments. We offer a full selection of body waxing and several wax types to provide you with the smooth skin you are looking for, exactly for your skin type and waxing needs. Perfect for any special occasion or just an every day tan. Choose between three levels of bronzer-light, medium and dark applications. Each tan is customized to your personal tanning expectations. Your non-invasive customized skin care treatment begins in our clean, safe and professional spa. We specialize in Body Contouring as well as a variety of other services such as Facial Aesthetics, and even massages. Overseen by dedicated licensed professionals, you’re in good hands as we deliver today’s most sought after, advanced medical technology. You may have seen the amazing breakthrough that was featured on the Dr. Oz and The Doctor’s Show… it’s called the i-lipo Slimming Treatment. We have it…no surgery, just results! Ever evolving beauty and skin care treatments, always on the cutting edge of Body and Facial Aesthetic technology. Modern Essentials Med Spa brings you state of the art technology for the highest quality medical aesthetic services available. We are committed to bringing these medical advances to everyone. We strive to always set affordable prices and give our clients as many treatment options as possible. ← Previous Story Wigs are Back & Better Than Ever!